Boomer Esiason and Daniela Ruah host this special celebrating the best TV commercials in Super Bowl history, and viewers will be able to vote live on Twitter for their favorites. 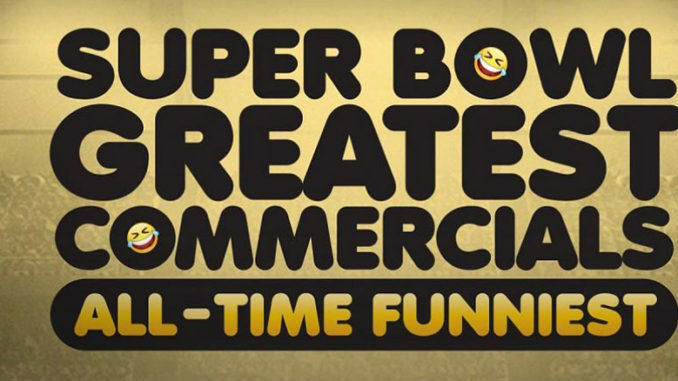 This year’s special will pick the All-Time Funniest Super Bowl Commercial from 10 hilarious nominees. Two commercials will advance to the live vote during the broadcast, and the ultimate winner will be revealed at the end of the show. FS1’s Tuesday night college basketball features Northwestern at Maryland in a Big Ten matchup. Later, ESPN2 carries the Mountain West clash between Nevada and UNLV. When Sherloque (Tom Cavanagh) wants to use a memory machine on Barry (Grant Gustin) and Nora (Jessica Parker Kennedy) to help gain access to Grace’s (Islie Hirvonen) memories, Nora panics, fearing her parents will find out the secrets she’s been keeping from them. Nora secretly decides to use the machine on her own, which ends in disaster after she gets trapped inside Grace’s mind. Marisa Tomei, Sheryl Sandberg and Kal Penn explore the tremendous challenges faced by their immigrant forebears. From Italy, Russia and India to America, their family histories show success could take generations to achieve. The New Orleans Pelicans face the Houston Rockets, followed by the Philadelphia 76ers in Los Angeles to take on the Lakers. Pat Spain searches for the Irish crown jewels stolen from Dublin Castle in 1907. He has three main suspects, and his investigation leads him to a former antiques shop in England, where he believes the valuables may be hidden. As connections are being formed, some couples start to question their relationships. Tonight’s college hoops doubleheader on FS1 has two Big East games: Marquette at Butler and St. John’s at Creighton. Adam (Sean Giambrone) is initially terrified when he and his friends are recruited to the William Penn Academy baseball team, but he quickly catches on to Principal Ball’s (Stephen Tobolowsky) master plan. A short-sighted Barry (Troy Gentile) is in denial about his pitching skills. Meanwhile, Geoff’s (Sam Lerner) dad interferes in his relationship with Erica (Hayley Orrantia). The Indiana Pacers visit D.C. for a matchup against the Washington Wizards in ESPN’s first game. The second game has the Utah Jazz in Portland to face the Trail Blazers. A Wednesday Night Hockey matchup of Eastern Conference contenders has Nikita Kucherov and the Tampa Bay Lightning striking at Sidney Crosby and the Penguins in Pittsburgh. Phil (Ty Burrell) may have conquered his biggest real estate challenge when he thinks he found Pepper (guest star Nathan Lane) his dream home. Meanwhile, in an attempt to connect with Lily (Aubrey Anderson-Emmons), Mitch (Jesse Tyler Ferguson) and Cam (Eric Stonestreet) get invited to an exclusive event for her favorite vlogger. As Season 5 ends, a new battle for Kattegat is on, and only the gods know who will emerge victorious. Vikings will be back for a sixth, and final, season. Dean Fogg (Rick Worthy) gets a new suit. Marcus (Benjamin Wadsworth) navigates a prank war between the Rats and Legacies, as everyone prepares for the big dance. Louis (Rick Hoffman) learns the finer points of managing Harvey (Gabriel Macht). Alex (Dulé Hill) is caught between Samantha (Katherine Heigl) and his wife. North Long Beach doesn’t really bring out the best in the buyers, though they do manage to make a charitable contribution. Darrell and Dave wager on who got the better sister — locker, that is. Brandi and Jarrod spend way too much but see their treasure soar. A Big Ten college basketball clash on FS1 has Purdue at Penn State, followed by a Pac-12 meetup between Oregon and Utah. Later tonight, catch Gonzaga at BYU on ESPN2. TNT’s NBA doubleheader features two exciting matchups as the Milwaukee Bucks visit the Toronto Raptors, followed by the Philadelphia 76ers in the Bay Area to take on the Golden State Warriors. Delilah (Stephanie Szostak) struggles to find a way to keep the house, while Ashley (Christina Ochoa) has a secret meeting with someone who she thinks may be able to help. Maggie (Allison Miller) receives news about her treatment. In the new episode “Kalamazoo and a Bad Wedge of Brie,” Christy’s (Anna Faris) plan to win her sponsor’s approval backfires, and the ladies rush in to help after Jill’s (Jaime Pressly) house is broken into. This 30 for 30 documentary revisits Oct. 11, 1992, when two-sport superstar Deion Sanders played for the Atlanta Falcons in Miami, then jetted off to join his Atlanta Braves teammates for an MLB playoff game in Pittsburgh. Gina (Chelsea Peretti) spends time with each member of the squad. When a wealthy celebrity has a massive estate, there’s often an army of people nudging around for their cut of the pie. In hourlong episodes of this series, husband-and-wife media experts and attorneys Danielle and Andy Mayoras explore the legal ups and downs, and fortunes earned and lost, by some of America’s biggest household names. Johnny Depp (tonight’s focus), Madonna, Britney Spears, Harrison Ford, Hulk Hogan, Donald Sterling, Casey Kasem, Lisa Marie Presley, Robin Williams and Sonny Bono are among those celebrities the series focuses on. In the winter premiere of the revived sitcom’s second season, Will (Eric McCormack), Karen (Megan Mullally) and Jack (Sean Hayes) unknowingly take a hallucinogenic drug, which causes Will and Jack to wonder if they’re each other’s soulmate and has Karen giving her last “performance” as Mrs. Stanley Walker. Meanwhile, Grace (Debra Messing) is shocked when her high-powered client (guest star Chelsea Handler) takes up with her sister Janet (guest star Mary McCormack). Nate (Billy Brown) is on a mission to prove he was right about the culprit in his father’s murder, while Bonnie (Liza Weil) begins to doubt herself. Annalise (Viola Davis) turns the tables in the courtroom. Poirot purists, hang on to your bowler hats. A new take on Agatha Christie’s sleuth awaits in this BBC version of her 1936 whodunit The ABC Murders. This Hercule Poirot (Oscar nominee John Malkovich) is an aging, friendless has-been. Sidekicks Hastings and Japp play no role in the hunt for the serial killer who leaves a railway guide beside his victims. The once-celebrated Belgian must beg an inspector named Crome (Rupert Grint) to help with the case. Most noticeably, the character’s iconic dyed, waxed and curled mustache … isn’t. In this series from Colombia (where it is known as Siempre Bruja), a 17th-century witch named Carmen (Angely Gaviria) must adjust to her new life after she time-travels to modern-day Cartagena to avoid being burned at the stake. Natasha Lyonne, Amy Poehler and Leslye Headland are executive producers — with Headland and Lyonne the writers — of this series that follows a young woman (played by Lyonne) on her journey as the guest of honor at a seemingly inescapable party one night in New York City. Just a few days after its world premiere at the Sundance Film Festival, this thriller bows on Netflix. Set in the L.A. art world, the story centers around the discovery of a series of paintings by an unknown artist. Soon after, a supernatural force enacts revenge on greedy people who profit from the work. Jake Gyllenhaal, Rene Russo, Daveed Diggs, Toni Collette, John Malkovich and Zawe Ashton star. Turner Classic Movies’ annual marathon surrounding Hollywood’s biggest awards night (airing on ABC Feb. 24) kicks off today. Each day of Oscar-winning and -nominated movies will be tied to various themes, and one of today’s themes is American Literary Adaptations. Enjoy a day of films beginning with 1935’s Alice Adams and including other classics like Little Women (1949), Show Boat (1951) and The Heart Is a Lonely Hunter (1968). It’s Chinese New Year and the Lees — Elaine (Ming-Na Wen), Julius (Reggie Lee) and son Horace (Jimmy O. Yang) — are back. Elaine tries to give Jessica (Constance Wu) tips on building a better relationship with Grandma Huang (Lucille Soong). Meanwhile, inspired by a Lee family tradition, Louis (Randall Park) challenges Emery (Forrest Wheeler) to a wrestling match to start the new year. In the new episode “Father + Bride + Betrayal,” Mac (Lucas Till) and his team crash a wedding to take an international crime boss into custody, but discover that they are not the only ones looking for him. While Red (James Spader) argues in court to uphold the validity of his immunity agreement, Liz (Megan Boone) and the task force question a man whose recent inheritance seems too good to be true, and Dembe (Hisham Tawfiq) offers Red some advice. Watch composer Nico Muhly’s reimagining of Winston Graham’s novel about a beautiful, mysterious woman who assumes multiple identities. Isabel Leonard stars in the title role alongside Christopher Maltman, and Robert Spano conducts. Dominique Witten and Ted Ferguson star as two burned-out city cops who relocate to a tropical paradise for a relaxing twilight to their careers. Unfortunately, it’s the most un-relaxing place on earth, and their new captain (Carl Solomon) is a champion shouter. The comedy premieres with two back-to-back 15-minute episodes. Harrison Ford, Mark Hamill and Carrie Fisher kick off the all-day/night Star Wars marathon with Star Wars: The Empire Strikes Back (1980), followed by Star Wars: A New Hope (1977), Rogue One: A Star Wars Story (2016) and Star Wars: Return of the Jedi (1983). A matchup of Big 12 powers takes place today in Lawrence, Kan., as the Texas Tech Red Raiders face the Kansas Jayhawks. Back by popular demand for a second installment, this special airs ahead of tomorrow’s Puppy Bowl broadcast and gives adult and senior dogs a chance to shine. The football-themed competition divides older rescue and shelter dogs, including several special-needs dogs, into two teams: Team Goldies and Team Oldies. As with the Puppy Bowl, all dogs that have participated in the Dog Bowl in the past have been adopted by loving families. Animal advocate Jill Rappaport hosts. The third film in the Vineyard franchise finds Frankie Baldwin and Nate DeLuca, played by Rachael Leigh Cook and Brendan Penny, preparing to host the Valentine’s Day wedding for Frankie’s cousin and Nate’s brother at their Napa Valley winery. But as Nate and Frankie help with the planning — which seems like a dry run for their own walk down the aisle — they begin to wonder if their differences mean they’re not the perfect pairing that they once believed. Based on a true story, this remake of a popular TV movie from the ’90s follows a shy girl (Aubrey Peeples) as she becomes resentful of the popular cheerleader (Sarah Dugdale) at her school. A night out together ends in horror, and the town struggles to identify the killer. In India’s Bandhavgarh Tiger Reserve, a tigress named Raj Bhera cares for her four newborn cubs while defending her hunting grounds against invading rival tigers — one of which is her own adult daughter, Solo. The NFL’s awards ceremony recognizes the best players, performances and plays from the 2018 season at Atlanta’s Fox Theatre. The 2019 Pro Football Hall of Fame class is announced, and the NFL and The Associated Press present awards for MVP, Rookie of the Year, Walter Payton NFL Man of the Year and more. Beth Stern, Alison Sweeney and Cameron Mathison host the frisky fun of Hallmark Channel’s first ever Cat Bowl, which features adult and senior cats in search of their forever homes. Plus, the event’s pawsome halftime show “Where Are They Meow?” will provide updates on former Kitten Bowl cat-letes including Jerry Mice, Puma Esiason and the star of Kitten Bowl V, Swirl.